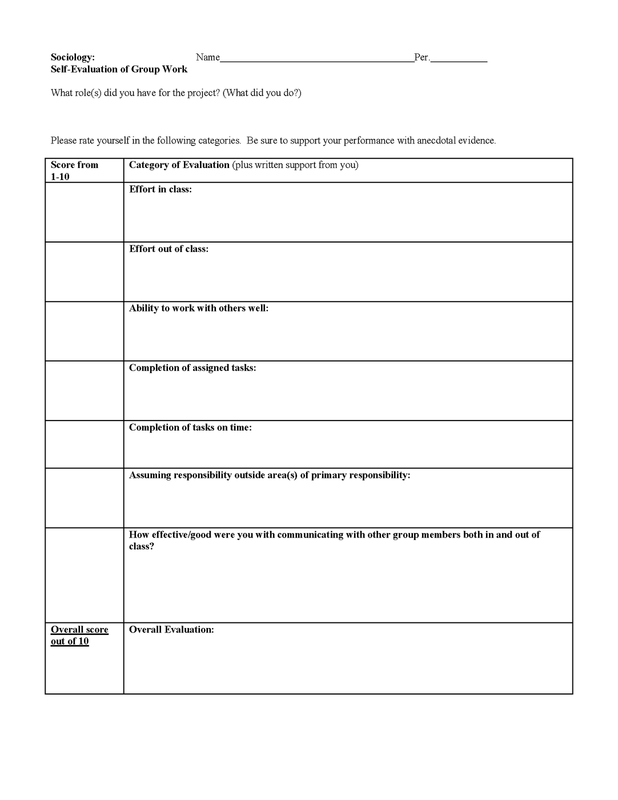 A recent topic came up on one of my listservs regarding how to evaluate student work in the context of student work groups. What grades are earned? Who did most/all of the work? What about those who disengage by social loafing? Should they get the same grade as the grade-conscious person who spent the most time/gave the most effort? I never liked the inherent unfairness of a "group grade." 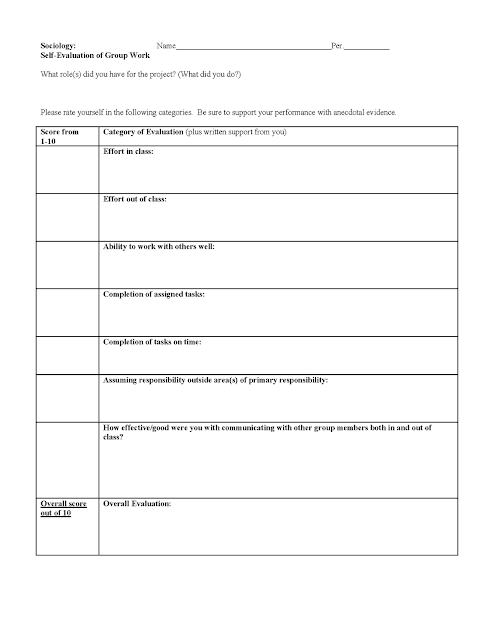 Self-evaluation form I use for group projects. In an effort to compensate for that, I created two evaluation forms. One is a self-evaluation and the other is a written evaluation of the effort of other group members. Please leave comments if you have suggestions for improvement. I am always open to getting better. I want to become a good teacher in my school and want to give more information about the best understanding for students. I will learn more things from here and recommend this site this blog post.This site is very compulsory for learning the teaching method and purpose of teaching. It's like a workshop of teachers and provides teaching materials. I am a teacher and want to become a good teacher in my life and get a highly fame in the profession of teaching. Teaching is a very https://www.dnpcapstoneproject.com/examples-of-dnp-capstone-projects/ responsibility profession in our society. Because they produce a creative nation for the development of the country. We use this website for preparing the lecture for my students and recommended that my students for checking the website for preparing the assignment and exams. The teacher has an important entity this article in the study field, without the teacher we will not achieve anything in the worlds.